For the first time, biologists were able to actually get a blood sample from wild whale sharks. The whale shark is one of the ocean's most mysterious creatures. Marine biologists know the basics — around how many there are in the world, where they live, etc. But they didn't know anything about what goes on inside a whale shark. It wasn't for lack of trying. The whale sharks just didn't make it easy. They have sandpaper-like skin that's 4 inches thick, for one. 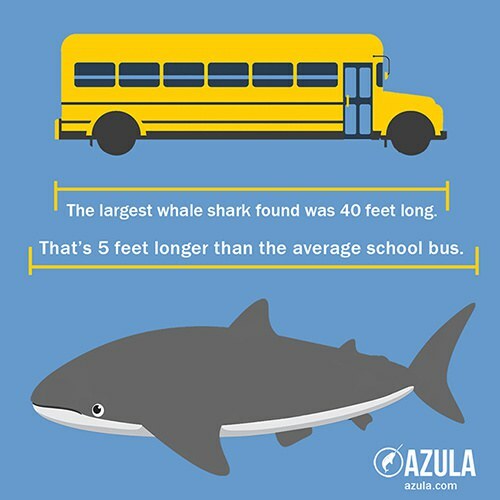 As the biggest fish in the sea, clocking in at the size of a school bus, they take up a lot of space, but are difficult to catch. Everything researchers knew about whale sharks they captured in 60-second intervals. Until now. For the first time, biologists were able to actually get a blood sample from wild whale sharks. They did it by teaming up with Indonesian fishers and using a special net to nab the big guys. Fishers lower large nets beneath special floating platforms. They attach lights to the platforms to attract baitfish above the nets and capture the whole school at once. Lucky for researchers, these fish are one of a whale shark's favorite snacks. Sometimes, whale sharks accidentally get caught themselves. When biologists found out about this, they worked with the fishers to draw blood samples for the first time ever and take measurements. The whale sharks are surprisingly chill about it. They don't need to swim forward to breathe, unlike most shark species, so biologists say they just wait quietly in the net until they're released. Then they usually turn around and start eating baitfish again! The scientists worked with the whale sharks for six hours in the water each day. While this process is easier than chasing them around underwater, their sheer size still makes working with them time-consuming, to say the least. But it's worth it, because scientists can now finally learn not just about the health of whale sharks, but about the health of the water they swim in, too. A blood sample can pick up on whether or not the sharks are consuming plastics in the water, and other pollutants. Now, we don't want to end this tail on a sad note, so here are some of the names researchers have given the whale sharks they've worked with: Mitch, Mr. Caspar, Barack, Moby and, of course, Sharky McSharkface. We would love to hang out with any of those whale sharks.